The evolution of personalized medicine is changing the way oncologists diagnose and treat cancer. Approximately half of all compounds currently in development are molecularly targeted drugs. The pharmaceutical industry is also rapidly moving beyond the development of single-target agents guided by single-biomarker tests, toward the development of drugs and drug combinations with complex mechanisms of action that will benefit from pathway-based diagnostics derived from an increasing understanding of the complex signal transduction network of living cells. Currently available biomarker tests for solid tumors primarily rely on dead, fixed tissue samples. Tests based on these static samples can reveal relevant mutations and guide general therapeutic approaches, but are generally not useful for understanding mechanisms of acquired resistance. For this reason, they are not optimally predictive of individual tumor response to targeted treatments. Fig. 1 | The SnapPath Cancer Diagnostics System. The system enables the use of predictive tests that guide targeted drug development and treatment selection for patients with solid tumor cancers. Patents covering the SnapPath system have been granted in the United States, Europe, Australia, Canada, Hong Kong, Japan and Korea. BioMarker Strategies has developed a system that has the potential to usher in a new era in which live, unfixed solid tumor tissue can be routinely and rapidly analyzed, in contrast to the current reliance on primarily dead, fixed tissue samples that provide limited insight into the biological complexity of solid tumor cells. The company’s patented SnapPath Cancer Diagnostics System enables the use of pre-dictive tests that guide targeted drug development and treatment selection for patients with solid tumor malignancies. “Our mission is to help make personal-ized medicine more of a reality for these patients,” said BioMarker Strategies’ president and CEO Jerry Parrott. 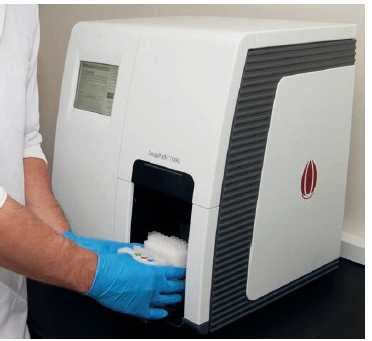 SnapPath is the only diagnostics system that can generate purified populations of live solid tumor cells from live, unfixed samples in an automated and stan-dardized manner. The system preserves the molecu-lar integrity of these living cells for ex vivo exposure to targeted therapies. This enables the generation of highly predictive biomarker tests, known as PathMAP Functional Signaling Profiles. SnapPath is unique in its ability to automate and standardize functional ex vivo profiling to capture the dynamic and predictive signaling information available only from live solid tumor cells. Ex vivo biomarkers are dynamic molecular markers, such as phosphoproteins, that are evoked from live tumor cells after removal from the patient. Unlike static biomarkers, which are detected from formalin-fixed, paraffin-embedded tumor samples, ex vivo biomark-ers enable true functional testing of cancer cells and can reveal important elements of tumor cell biology, including signal transduction circuitry. SnapPath is a highly customizable, automated, fluid-ics-based system. It consists of a compact benchtop instrument and a single-use cartridge (Fig. 1). The system generates purified populations of live solid tumor cells from a fine-needle aspiration biopsy, surgical excision or other live, unfixed tumor tissue sample. SnapPath is compatible with any solid tumor for which live tissue samples are available. The process begins with the loading of live tissue samples onto the single-use cartridge, which is then snapped into place on the SnapPath instrument. The automated process takes as little as 30 minutes and involves five steps: dispersion, enrichment, distribu-tion, modulation and stabilization. In the dispersion step, the live solid tumor tissue samples are mechanically disaggregated into smaller, more homogeneous populations of living solid tumor cells. Following disaggregation, non-tumor cells such as red blood cells and white blood cells are removed from the sample using antibody-coated magnetic beads, thereby enriching the tumor-cell population to facilitate downstream molecular analysis. The live cells are then distributed via automated fluidics into multiple test chambers for ex vivo modulation. Following distribution into test wells on the car-tridge, the live solid tumor cells are modulated by exposure to targeted therapies to evoke newnbiomarkers. The last automated step involves stabilization of the modulated live cells using the technique appropriate to the analytical method of choice. The SnapPath system is agnostic to the type of analytical technology used. An algorithm is then applied to the off-platform analytical result, yielding a Functional Signaling Profile, which provides predictive information about drug response and resistance that cannot be obtained through DNA-based or RNA-based analysis of dead fixed-tissue samples.